When you first graduate from college, you may be more focused on finding a job and setting so that you do not pay much attention to your student loans. The student loan counseling required for graduation may briefly explain your responsibilities, but it is important that you take action with your student loans now, even though they should go on automatic deferment for the first six months after your graduation. It is important to update your contact information for your student loans when you first graduate and every time you move. You will still be responsible for making payments after six months whether or not the statements make it to you. Updating your information and using a permanent address (such as your parents’ address) as a backup will help you to receive the information in a timely manner and determine the best way to manage your student loans. Although your student loans are supposed to automatically go on deferment when you graduate, sometimes there is a mistake and the student loans do not. You may end up with late charges and interest payments if you do not verify that the student loans are on deferment. A simple phone call to your loan company will allow you to verify this and save you the hassle of straightening out a mess after it happens. You may have the option to consolidate your subsidized and unsubsidized loans into one payment once you graduate. It is much easier to make one student loan payment than it is to worry about making several. However, you should never consolidate federal student loans in with your private student loans. This will cause you to lose the benefits that come with student loans like the Income Based Payment option or a hardship deferment if you lose your job. Private student loans do not offer the same payment terms. 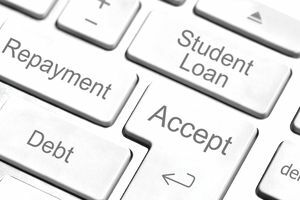 You may want to consolidate any private student loans you have and try to refinance to a lower interest rate that you can lock in It may be difficult to do this until you have your first job, but it is something you should consider. Private student loans have a much higher interest rate than Federal Direct Loans, and it is often variable. Depending on the type of private student loan, you may not be able to claim the interest as a tax deduction. Private student loans should have the same priorities as credit cards when it comes to paying off your debt. It is worth looking at the different payment options that are available based on income and job choice. The Income Based Payment option will base your monthly payment on your income. You will need to submit your income each year, and as it goes up so will your monthly payment. If you have not paid off your student loans after 30 years on this plan, the remaining balance will be forgiven. You can also temporarily stop making payments for a hardship deferral if you lose your job or face another financial crisis. It is determined on a case by case basis, and you must contact your student loan company before you stop making payments to qualify. Another option is to consider student loan forgiveness options. If you work for the government or a nonprofit for 10-year and you have Federal Direct Loan, you can have the remaining balance of your loan forgiven if you have paid on time during those ten years. Teachers qualify for a similar program, but the term is generally five years. Some states may offer different loan forgiveness options, and some jobs may offer incentives and money to put toward your student loan as a signing bonus or after you have worked there for a set period. Taking the time to look for these options can help you save money and determine the best way to deal with your student loans now and in the future. Student loan debt can be crippling, especially when you are struggling to make ends meet with your first job. It is important to set up a plan that will allow you to pay off your student loans as quickly as possible. One part of this is setting up a budget that leaves room for extra payments on your debt. You should start with your private student loans and any consumer or credit card debt that you have from college, and then move on to your federal student loans. It is because the interest rate is lower, and because you can claim a portion of the interest on your taxes. You may need to be creative in finding extra money to pay on your student loans like taking on a second job or freelancing to bring in the extra money.